About 15 minutes ago, I listened to "Girl from Ipanema" from an album of Charlie Byrd & Ken Peplowski. It's a special song for me that I never get tired of listening, maybe more than 10 years. Suddenly I wondered exactly what & where was the "Ipanema"; and I wanted to learn something about there. 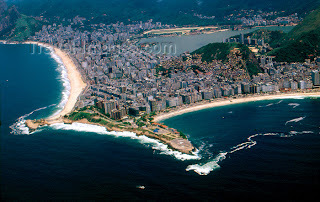 I found some information on wikipedia, and (by some shortening) I wanted to post it in my blog..
Ipanema is a neighborhood located in the southern region of the city of Rio de Janeiro, Brazil, between Leblon and Arpoador. The beach at Ipanema became widely known by the song "The Girl from Ipanema" ("Garota de Ipanema"), written by Antonio Carlos Jobim and Vinícius de Moraes. Most of the land that Ipanema consists of today once belonged to José Antonio Moreira Filho, Baron of Ipanema. 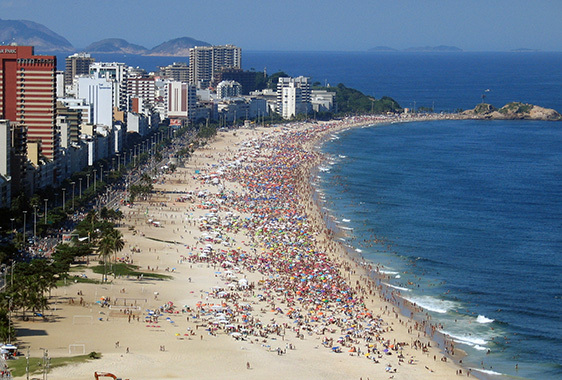 The word "Ipanema" did not refer originally to the beach, but to the homeland of the baron at São Paulo. 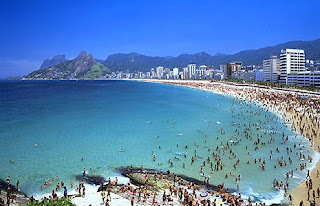 Ipanema gained fame with the start of the bossa nova sound, when its residents Antônio Carlos Jobim and Vinicius de Moraes created their ode to their neighborhood, "Girl from Ipanema." The song was written in 1962, with music by Jobim and Portuguese lyrics by de Moraes with English lyrics written later by Norman Gimbel. Ipanema is adjacent to Copacabana Beach, but it is distinct from its neighbor. It is relatively easy to navigate because the streets are aligned in a grid. Private infrastructure has created world-class restaurants, shops, and cafes. Ipanema is one of the most expensive places to live in Rio. At the forefront of the beach culture are the many surfers and sun worshippers who socialize daily at the beach. Every Sunday, the roadway closest to the beach is closed to motor vehicles and local residents and tourists use the opportunity to ride bikes, roller skate, skateboard, and walk along the ocean. Ipanema has played its own role in Rio's culture since its beginning. It has universities, art galleries, theaters and cafes. Ipanema holds its own street parade during Carnival festivities, separate from Rio de Janeiro's. Banda de Ipanema attracts up to 50,000 people to the streets of Ipanema for Carnival. It is famously known for its elegance and social qualities. Two mountains called the Dois Irmãos (Two Brothers) rise at the western end of the beach. The beach is divided into segments by marks known as postos (lifeguard towers). Beer is sold everywhere on the beach along with the traditional cachaça. There are always circles of people playing football, volleyball, and footvolley, a locally invented sport that is a combination of volleyball and football. In the winter the surf can reach nine feet. The water quality varies with days of light-blue water to a more murky green after heavy rains. Constant swells keep the water clean. The often treacherous beach break regularly forms barrels. Just west of this colorful section and towards Leblon is another popular stretch of sand known as Posto 10 (10th lifeguard tower) where young and often beautiful carioca men and women hipsters congregate. The Travel Channel listed Ipanema Beach as the sexiest beach in the world.